The fieldfare is not much liked by people and not very well known either. 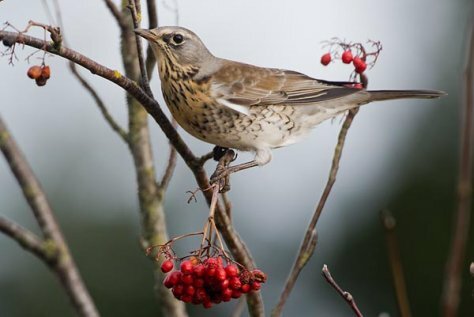 Not liked because mostly the emptying of berry bushes is blamed on fieldfares but all thrushes, the starlings and many other passerines are industriously busy with this – but someone has to be the scapegoat. The autumn migration of bypasser should start in this beautiful cold and calm weather; feeding here they always move in groups because they are social birds. Even in winter flocks of fieldfares are quite common; they can be encountered in some larger orchard prying seeds out of frozen apples or near open flowing waters ... The migrants pass through in October-November, most numerously in the western islands and the northern coast, but of course they can be seen elsewhere too. If there is enough food the numbers of winterers can be quite large, from tens of thousands to hundred thousand. 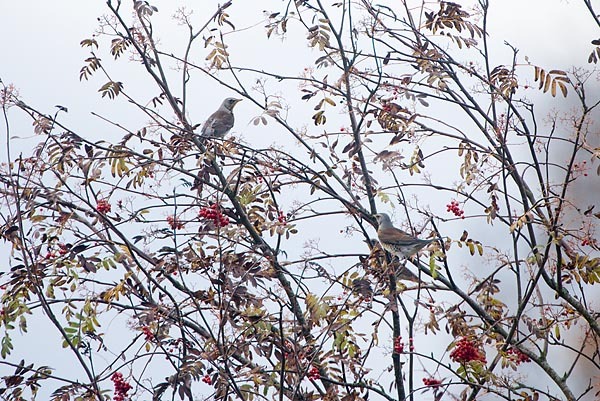 Fieldfares are the biggest of the thrushes. Both sexes have quite similar plumages, in flight the white undersides of wings show. Head is grey, back brown, and the yellowish breast has black lengthwise stripes that look like black scales at the sides. The rump area is the same colour as the head – grey – and the black tail is long as always with thrushes.